We arrived in Dublin on a Sunday morning. A fine, flat rain punctured the surface of the Liffey, and the streets were all but empty. We passed three elderly women, each wearing raincoats the colors of jewels. They, and the doors in Merrion Square provided the only color. We'd flown overnight, a plan that seemed ingenious when I booked the tickets in February (fly out at one country's dusk, arrive at the second's dawn), but in reality, it was as brutal as it sounds. We didn't sleep on the flight. Chris's restless legs got the best of him, and he described his skin feeling as though it were crawling. The man next to us complained that this was the smallest plane he'd even ridden, and while we have less frame of reference, we were inclined to agree. We landed the walking dead. I was so tired that, even now, those first few hours seemed surreal. Compared to the constant movement of New York, the empty streets were a relief. It took a two mile walk (with suitcases, on small sidewalks and cobblestone--I still have bruises on my ankle) to our Airbnb to orient myself to the clock, to the day, to our trans-Atlantic position. Dublin quickly became for us a city of lessons. The four days we spent here were decidedly rocky. Jetlag made us susceptible to the anxieties we're both having about our move, and neither of us handled well the discomfort of the unknown. While Dublin is a small, walkable, charming city with English speakers everywhere, the simple fact that it wasn't home was enough to dislodge our equilibrium. On our second day in Dublin (the sixth of our trip), we looked at each other and said we just wanted a break from all the decision making. Breakfast -- but where? And lunch -- but were? And what should we do today? Where is that? How will we get there? The short of it: Dublin is where we had to admit we didn't have a groove. As we planned this trip, we both acknowledged how much we had to learn. This was to be our first trip as a couple, the first (large) trip for either of us without parents, the first we we're taking as adults. I'd hoped traveling would come as easily to us as so many other aspects of our relationship, but it didn't. It took some learning. Our first day in Dublin corresponded with our one year anniversary, and in retrospect, I like the timing. Dublin stretched us, made us grow. We started our second year in a place of vulnerability. We had to get tender with each other, and honest with ourselves. Why were we at odds? Why were we on edge? A mother once said to me that from raising children, she'd learned that most problems between people can be solved with food, water, or a hug. I thought about that on our third evening, after we'd bickered our way through Temple Bar and ended our evening early so we could talk, uninterrupted by the movement of the city. Our anxieties are always over connection. How do we tell the other what we want? What we need? How do we ask each other to hold the places too bruised for us to even name? And as much as these tensions manifested themselves in our traveling (we are kings and queens of "but I want to do what you want to do"), they weren't about travel. They hadn't anything to do with travel. We bring ourselves with us wherever we go. It's the great myth of escape that we could ever lose our pain. In Dublin, we bickered over plans, but when we stopped to address the tension, we talked about deep-rooted insecurities, the mixed fear of and desire to be known. We talked about our move, and about how excitement is starting to blend with anxiety, with sadness. While Dublin ended up being less about Dublin and more about our relationship, I should clarify: Our days here were good days, punctuated by tension (not the other way around). After my anxiety to see everything! do everything! lessened, our days mellowed. Dublin is a charming city with an understated beauty. Compared to New York, it felt like a village, and we were so happy getting lost in down these twisting streets. Our first four days here in a nut shell: Irish War Memorial Gardens were an oasis along the Liffey. The Little Museum of Dublin was delightful, and because it's made up entirely of donations from Dubliners, it's a fascinating perspective on this city's history. I wish we'd gone the first day as an orientation to this city. We're in Dublin, so we had to drink Guinness. We toured the storehouse on our second day here, and as much as the tour was an advertisement for its brand, it was fun, and the best way to share a pint. Temple Bar was far too crowded for us. The Winding Stair Bookshop was lovely; the swans in St. Stephen's Green made me squeal, and the best food we had all week was the scones. Irish scones have ruined me for all baked goods. I'll never be the same. My favorite moment of all though was the quietest. 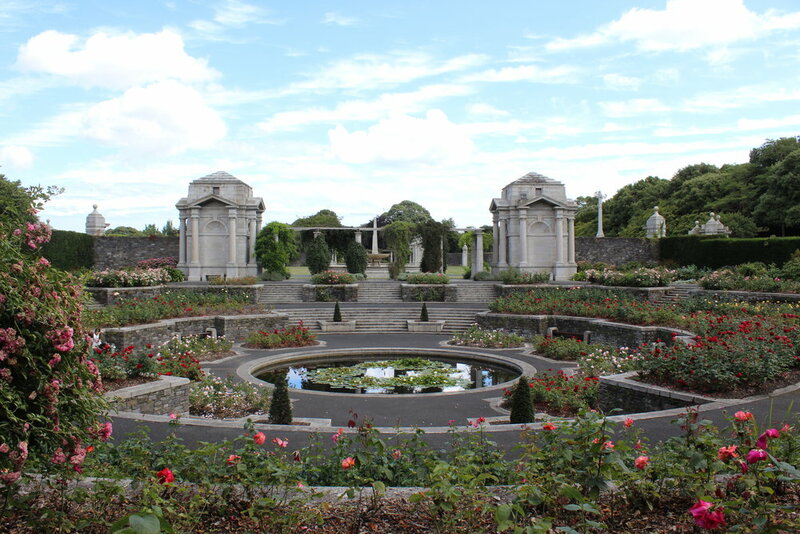 After attempts at two museums failed (one was closed, the other required advance booking), we found ourselves in the Irish War Memorial Gardens. The rain showers of the morning had given way to blue sky, and a sun so warm I shed layers until my arms were bare. We found a rock on the bank of the Liffey and dangled our feet over the clear water. I watched a bird's small, webbed feet pedal underneath the water. In so many ways, this could have been any other afternoon in the sun, but after spending six months saying to each other "baby, we're going to Dublin!," we were here. In Dublin! In Ireland! In the middle of this adventure! Forever let that be enough. In my teenage-hood, I planned to live, someday, in New York City. I studied street maps and photographs of the city, choose books written by writers who lived there, and tried to write my own stories about the life I imagined must exist there. All week, I thought about that verve, that determination. What had I expected, at fourteen, to find in New York City? And if I had moved, would I have found it? We arrived in New York City at noon on Wednesday, and immediately, the city felt like an onslaught. We tried to keep our suitcases out of the way, and around us, people moved with such velocity I felt like it was the beginning of a bad movie. Midwest girl comes to New York, retreats to the corner, because the cornfields never moved like this. This intimidation dissipated, thank god, once we found the correct subway station and dropped luggage at the apartment we were staying in, but what remained was the feeling of being challenged. 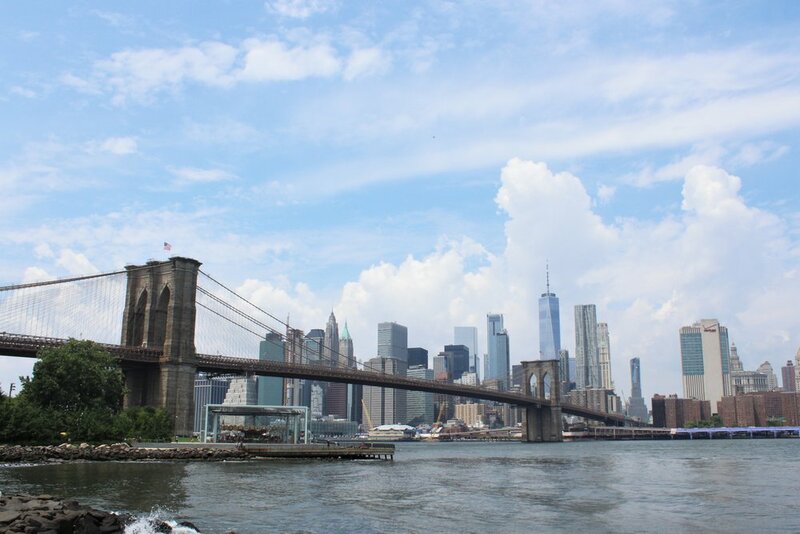 For much of the week, my experience in New York resisted any narrative or structure. I tried, several times, to journal (a habit I’m bribing myself into building with pretty stationary), but I couldn't reconcile. There was the extraordinary beauty of a city designed to live up to its reputation, the layers of neighborhood and street that peeled back as we walked, and the sense I couldn't shake of not being able to see the city for all the towering buildings. There was the activity of tourists (like us, I won't pretend we were anything but)—Fifth Avenue a melee of money and cameras, but I kept thinking of all the people who live here. Cynthia Nixon once said that eleven or twelve (I can't find the quote) is the golden age for a kid in New York, because they're finally old enough to ride the subway alone. The foreignness of that experience—at twenty-five, I felt barely capable on the subway system, having hailed from the land of freeways and multi-car families. I'm reading Olivia Liang's excellent memoir/meditation on loneliness, which colored my view of the city. Never have I been in a place where I've seen so little personal space, and yet, such a collective preservation of what does exist. In Minneapolis and St. Paul, I’ve learned to avoid eye contact when I don't want a conversation on the street or in a cafe, but in New York, I was liberated to realize that proximity wouldn't necessitate small talk. By that same token though, Liang wrote of New York as a "city of glass, of roving eyes," and I quickly saw how atomizing this city can be, how lonely it could become. Then there's the size of the city itself. The bewildering depth of history, culture, experience. That we walked above the footprint of the original Dutch colony just blocks from the site of the World Trade Towers attack on our way to board a ferry to see the Statue of Liberty and Ellis Island, the entry point for 30-40% of people living in America. That hours later, we passed the Stonewall Inn and a townhouse James Baldwin once lived in and the fictionalized site of a TV show was too much to hold. I'm not sure how anyone, let alone a tourist passing through here and there, can ever try to hold the breadth or depth of what New York is or has been. Our few days in New York righted itself as the plane lifted off from JFK. We flew at dusk, and when I looked out during takeoff, I saw the city. A gray line of skyscrapers cut out from the pearl grays and pinks of dust. So fine and so flat a sight it looked like a page from an illustrated book. This is how the city positioned itself for me—there’s the city itself, and then the shadow of it. Our experience being the shadow. What is New York? What makes it special, makes it unique, defines it? I have no idea. We saw Central Park and Fifth Avenue, bought books from Three Lives & Company, ate brunch at Sarabeth’s. Walked fifty miles across this narrow island. I’ve loved this city from afar for long enough to know what’s said of it: that you don’t understand this city unless you’re born there, that you don’t get to call yourself a New Yorker until you’ve lived there ten years, twenty years, unless your parents too lived there, unless you’ve cried on the subway. Any version of New York that a tourist seems is a slice, a pale version of its totality. I don’t say this begrudgingly. I’m not sure New York is meant to be an easy city. The friend I visited said our first night “this city is gritty and harsh; it’s not meant to be pretty.” To visitors, it poses a challenge: what did you come for? We came to do nothing more than see the city, but even that was dizzyingly broad. 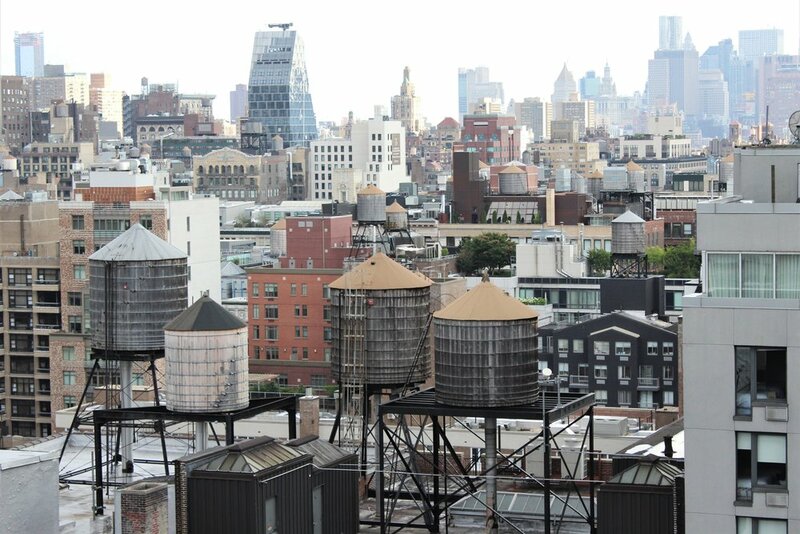 No, we came to see slices of New York: Bleeker Street and the High Line. Fifth Avenue (the busy stretch) and Madison Avenue (the quiet stretch). The Statue of Liberty, and the eastern edge of the island from the back of a retreating ferry. My friend took us to a sports bar so busy on a Wednesday night it had a bouncer, and to one of her favorite bakeries (Levain—the cookie so rich I couldn’t finish it in two sittings). I met her eight years ago, and she moved to New York two years ago. I watched in awe as this Midwest girl I met in the dorms navigated the subway, the intersecting streets. The city that seemed so inaccessible yielded slowly. The green of Bryant Park after the crush of Fifth Avenue. The café we went for coffee, baseball on the TV and Childish Gambino on the stereo. The surprises of Central Park, and the Upper East Side’s empty streets on Saturday morning. The two bottles of wine we split on Thursday, and the ways we talked—old friends—about leaving, returning, growing. New York came to us in pieces. There was no way we were going to experience it as a whole, but even though I knew this, I still felt a pang of sadness. It reminds me of the limits of travel. For as much as it expands you, there’s only so much a tourist can receive. There will always be the hidden city, the one that operates outside the reach of the visitor, exists between buildings, behind streets, out among the crush of bodies. There’s always going to be the inaccessible experience, the totality of what it means to live somewhere like this, not just visit.